Supreme and Vans go together like peanut butter & jelly. With Supreme gearing up for their 25th anniversary this year, a new project between the NYC skate brand and California footwear giant has surfaced online, expected to release soon. Vans never go out of style. The brand has been pumping out some of the hottest casual shoes around since 1966, with no signs of stopping anytime soon. While some of the skate brand’s styles are not as popular as others, that doesn’t mean there isn’t someone out there paying attention to each and every one. Apparently, that someone is a brand, and that brand is Supreme. This week, a new collaboration between Supreme and Vans has surfaced online, expected to release sometime this Spring. Using the ever-popular SK8-Hi as a base, using nylon and suede for their latest iteration. The toe cap, lacing system, and heel counter are constructed from a clean black suede, with patterned nylon taking over each quarter panel. The pattern is reminiscent of diamond plated sheets, often found in the streets of Supreme’s home, New York City. The new collection of Vans for Supreme has not yet been announced for release, though they are expected to launch with Supreme’s upcoming SS19. Currently, there are no retail prices available for the latest Vans shoes, but due to the added factor of Supreme, prices are likely to rise above their standard levels. Check out the early photos below for a better look at the new collection, and stay tuned to JustFreshKicks for more hot Supreme news. 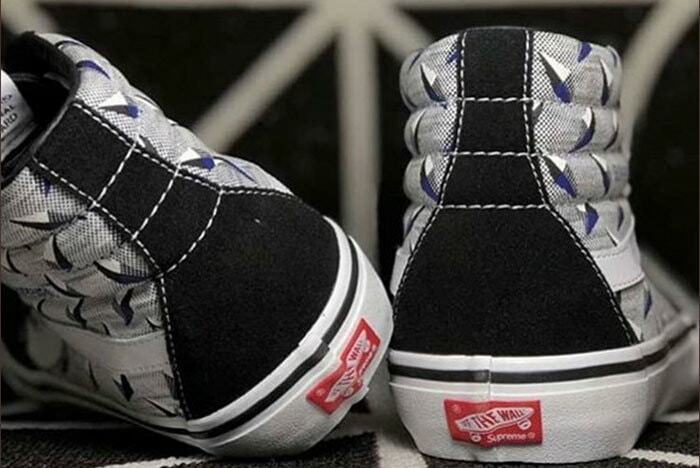 The post Supreme and Vans Have a Diamond Plated SK8-Hi On the Way appeared first on JustFreshKicks.